Paints formulated to Beautify, Last and Protect since 1921. On a sweltering Mobile, Alabama afternoon in 1921, two young men set out on an adventure. Familiar with the construction trades, both had seen first-hand how paint quickly mildewed, crazed, cracked, and failed on the beautiful antebellum homes lining Government Street. They knew that if they could solve this issue, they’d not only preserve a beautiful part of our history, but they would sell paint till the cows came home. So, Mr. Benson & Mr. Luscher founded Mobile Paint Manufacturing Company with the stated goal to create coatings designed specifically to last much longer than other paints in the semi-tropical climate of the Gulf Coast. Mobile Paint Manufacturing Company was born on the third floor of a waterfront building in Mobile. We had one salesman and few other employees. It was a modest beginning, but that’s where the magic happened. 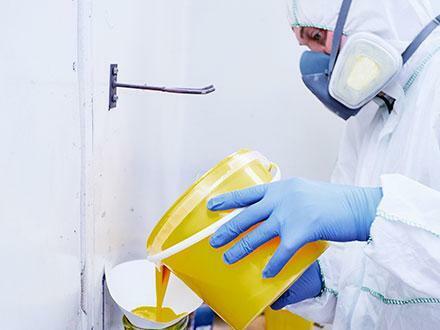 Our small, persistent team succeeded in formulating a line of resilient paint that took the heat, humidity, rainfall, and storms far better than other paints manufactured for national distribution. In 1925, we purchased Mobile Varnish Works, thus gaining access to an expanded customer base. The company was not only a success, but we had done it by solving a problem unique to our area. Fast forward through the decades and it’s easy to see why Mobile Paint Manufacturing Company continues to thrive; we’ve never lost sight of improving the “Southernized” formulas that make us the clear choice for the Gulf Coast. Our team of highly qualified chemists strive to develop coatings for residential/architectural, commercial, industrial, OEM, and marine applications from a modern research & development, manufacturing, warehousing, and shipping facility in Theodore, Alabama. Through all the success and growth, the core mission remains: To continually develop coatings solutions that solve problems for customers. This custom-coatings approach holds true across all market segments from caring for the antebellum homes that first inspired Benson & Luscher, to highly specialized industrial and marine coatings.